Worried about having your kids lift weights too early? Parents only want the best for their children. In addition to enrolling their kids in the best schools money can afford, parents also want them to be engaged in other activities such as art and sports to become well-rounded individuals. While a paint brush or a guitar does not present any risk to health, the same cannot be said for sports. Many children naturally gravitate toward sports. It is a natural extension of play time. Eventually, play transitions to competition. And parents would always want their children to be competitive. They will hire the best coaches, buy healthy food and would sacrifice time to drive their children to training. It is a debate that has gone on for decades. Ask your father or grandfather. Chances are they had gone through the same discussions with their own parents. The debate stems from the belief that weight lifting can stunt growth. There are some who postulate that overhead exercises such as the Squat, Overhead Press and the Deadlift can apply compression forces on the spine and make children shorter. They point to champion weight lifters they saw on TV who appeared to be short in stature. In the first place, that is not the basis for the argument versus weight lifting for kids. Second, weight lifting is categorised according to weight classes. The lighter lifters are more compact and therefore shorter. Keep watching until you get to the 105 kilo heavyweights. The area of contention concerns the effect of weight lifting on growth plates. Also referred to as the epiphyseal plate, this is developing tissue that is found at the ends of long bones of children and teenagers. Doctors contend that if the growth plate is shattered or damaged, it would lead to abnormal growth in the limb or cessation of progressive development altogether. This train of thought led the American Academy of Pediatrics (AAP) to issue an advisory against weight-lifting for pre-adolescent children in 1983. 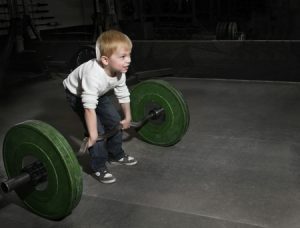 Since then, numerous studies have been conducted on the effects of weight-lifting on children. Several of these studies have dispelled the fear of weight-lifting stunting growth. One of these studies was made in 2000 by pediatric exercise scientist Avery Faigenbaum who is also a college professor at the College of New Jersey. Better prepare young athletes for the demands of practice and competition. In a recent interview, Faigenbaum maintains that since the publication of his study, more people from the medical and fitness industries have made a 180-degree turn on their opinions regarding weight-lifting and children. In fact, the AAP in 2010 denounced its 1983 statement when their own studies with the Institute of Training Science and Sports Informatics in Cologne, Germany showed the ability of weight-lifting to enhance the strength of children beginning age 6. 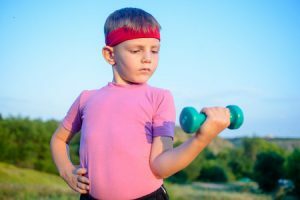 The study of the AAP revealed weight-lifting at a young age closed the strength gap between pre-pubescent children and those going through puberty without damaging effects on height and development. So is weight-lifting safe for kids? Always focus on proper form and technique. If the evidences and studies are not enough to convince you to put your child on a weight-lifting program, focus first on bodyweight exercises until he or she reaches the age of 13. Then slowly introduce the child to basic, compound exercises using a program of light weights and high reps.
Keep track of your child’s progress. Done properly, weight-lifting will carry over to your child’s performance in sports and improve his or her overall health and fitness.